Didn't realize counter and floor marbles were different. Rip out? I thought I was working with cararra on both the counter and the floor. 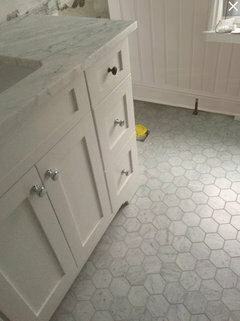 Took samples to the stoneyard, looked fine with the countertop. I even laid out the floor tiles on my bedroom floor and they still looked good. Once they were grouted in, blue cast. The thin set is white so it's not that. Then the countertop came and it's statutory which I just didn't realize. Beautiful but doesn't really go with the floor. 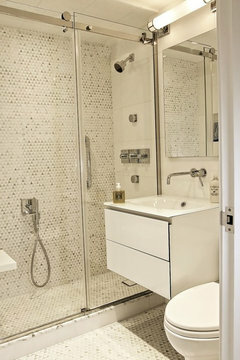 The tiles will be white subway and go 43 inches all round the bathroom. 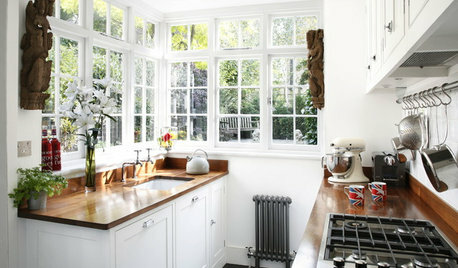 Between the two it would be easier to replace the countertop (and probably the sink which would break in the process). I'm trying to decide whether painting the walls or painting the vanity a blue gray would help bridge this. In the photos the floor looks whiter than it really is. It's definitely on the bluer side. 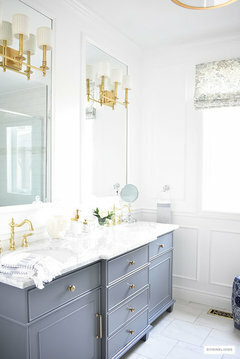 or painting the vanity would help bridge the two...or if it just won't work. In the photos, the marbles look lovely. I agree that they don't need to match. However, if it bothers you, I don't think paint will help (I am speaking from experience). 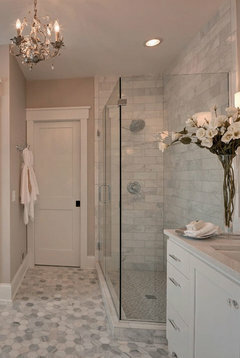 Is this your master bath? 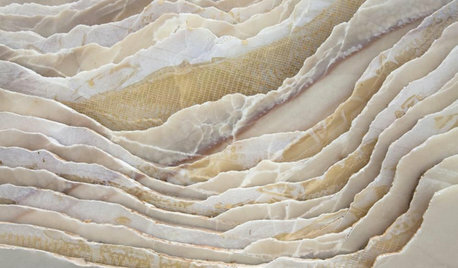 If you have found a marble counter that you will like markedly better, I would rip the counter out and go with that. Otherwise you'll never think it's "right." I love your counter and floor. The coordinate well enough. 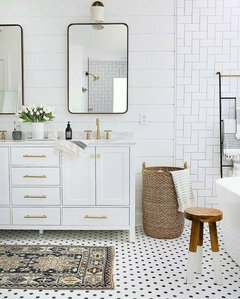 I am worried about the white subway tile. Not sure that is going to work with this mix. 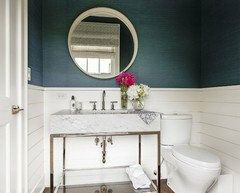 I might consider creating a wainscot in wood that matches the color of the vanity. 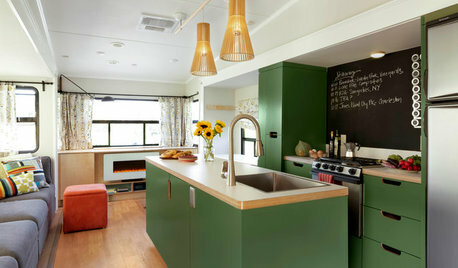 L none: the problem is that I do love the countertop...it's so pretty. So if I take it out it would be only to get it closer to the color of the floor tile which is on the blue cast side. The counter is much whiter. Beverly, why don't you think the subway will work? I worried a little about the scale of the subway being 3 inches and the tile on the floor being 4 inches but I decided not to worry about it. So you think a wood wainscott would work better? I have to do something since those areas are not covered in plaster. Lnone I am worried that I'll always be thinking, mmmm not quite right. It is a master bath. Keep the countertop! I love Statuary with the carrara tile. Looks lovely! How long has the floor been in? It can take weeks for the thinset to cure properly. It will continue to lighten as it cures. Leave it. I think it looks good, you don’t want it matchy matchy. The white subway should still work. 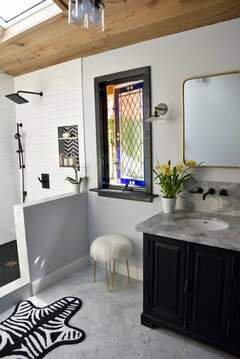 And yeah you may pick a paint with the color you want to stand out from the tile but not sure if it’s really going to tie one from the other. 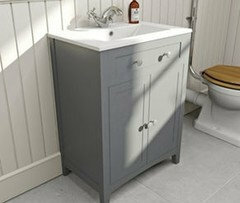 Vanities can stand on its own without matching anything from my opinion only. Very pretty. Love it. My vote is to keep it as is. Always a slight variation with natural materials, would look false otherwise imo. Leave it. It's lovely. These are natural materials and not meant to be matchy matchy. 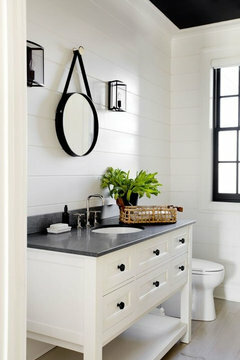 I like Beverly's suggestion that you consider a wood wainscot painted to match the vanity instead of white subway tile. It looks beautiful! 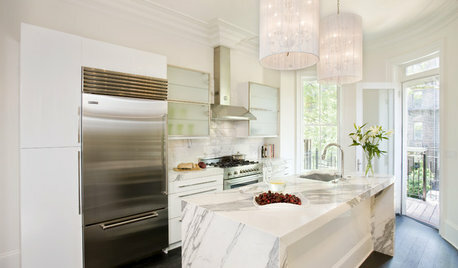 I have calacatta tiles on the floor and calacatta slab countertops and they have some difference in coloration. It bugged me at first but I pressed on and love it now. 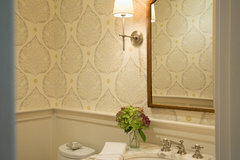 Once you have your fixtures in you will see it all come together. I have no idea what the issue is they look great carry on and get over this. I'm grateful for all the reassuring comments and I'm calming down and trying to see the whole thing rather than just that one color difference. 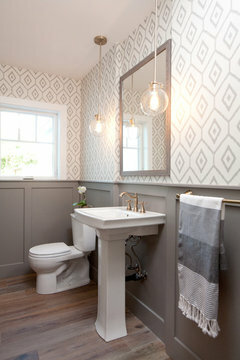 I do like the idea of a wood wainscott instead of tile but I didn't have them do a backsplash with the countertop because I thought I was doing tile. 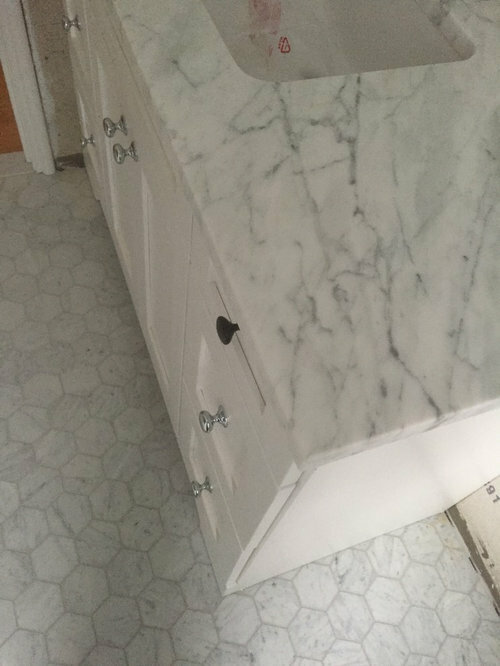 Could I put the wood directly behind the sink or would I need to have some sort of backsplash? Here you can see the the fixtures will be pretty close to the back of the wall. It looks great. Keep it! makethechange thanked Zalco/bring back Sophie! I also think it looks lovely together! I'm a big fan of wallpaper in the bath. My friend designed her bath very similarly to yours. 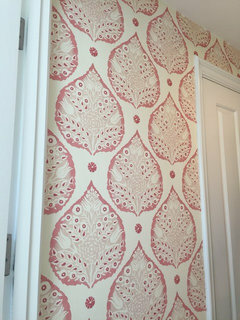 She bought a hand-made wallpaper in this pattern she had custom colored in blue and grey. I have a carrara floor and a Super White countertop. I think they look great together. So does yours. 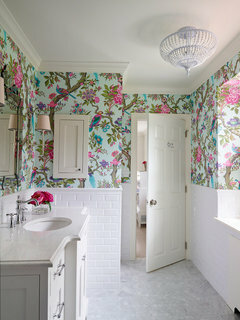 Go ahead w/your white tile, but think about doing an actual color on the walls or even a wallpaper. maybe bring in a wood stool, or some wood shelving, a few plants. you could also try changing your bulbs to something less blue and a bit warmer. that might help. 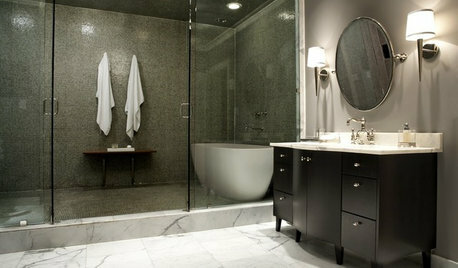 Beth H. and houssaon Beth, love the wood tone in your bath and your marble works great. . 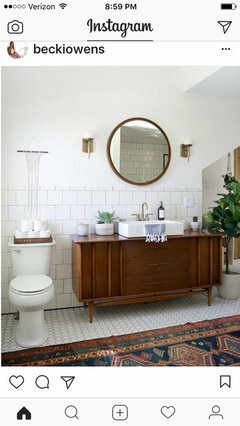 I think a small stool (my bathroom isn't large) in a wood would add some nice warmth with all the coolness. I've actually been looking for something in wood to pull in the floors right outside the bath. houssaon: that wallpaper is amazing. I would have never thought to have wallpaper custom colored. I do love all the photos with the pretty wallpapers. My style is pretty plain generally but I do love the way it looks. stick with the plan. it will be beautiful. It looks fine. because they are not that different, especially with the octogonal floor, you really can't see the veining like on the slab countertop. Don't change it. 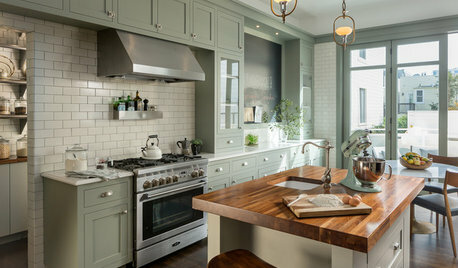 However, don't use subway tiles you just have to many shapes and it looks way to busy with all the shapes and sizes. Using a brick pattern on the wall honestly looks terrible. If you insist in using them just stack them and blend them in with the same color grout. I prefer the bead board. It looks much cleaner and simple. Less is more! I have won "5 National Awards for my Baths". 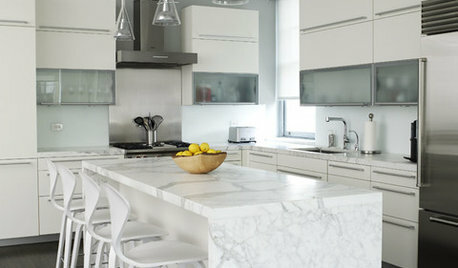 Take a look at my Houzz Page or website?dabinteriordesign.com. makethechange thanked DAB Interior Design, Inc. Yes throw it all in a landfill and start over. Good idea! I get what your saying. I couldn’t quit comparing either. Because it’s just not what you were planning or expecting Or paying for. Learn to live with it? Only you can decide if it’s going to bug you forever. grover axle: , showing me a picture of how the subways might look and how the wood bead board might look, helps tremendously. Thank you for your work. Seeing the subway I can see how busy it will look next to the 4 inch hex. It's too much. Too many lines. I think I'm persuaded that the bead board or some kind of wainscotting will work better. 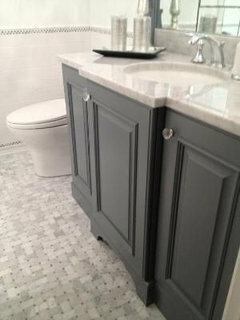 The issue I've always had with the beadboard in the bath is the transition over the vanity. 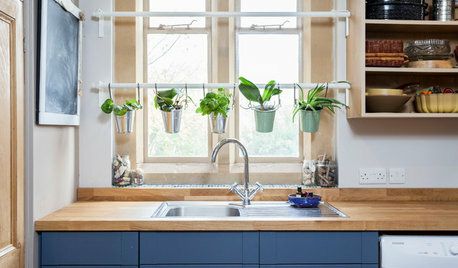 I think it looks better to just carry the wood behind the faucets rather than stopping where there is a backsplash. It just means being mindful of splashing water. The good news is there is cement board there. Maybe I could have them red guard it as well for extra protection, if you can do that behind wood. All of these comments are so very helpful. And jn3344, I agree tearing out the countertop would be extremely wasteful, especially since it's a thing of beauty. My plan was to repurpose the larger pieces for the kitchen. I may be missing something but why do you need anything there? 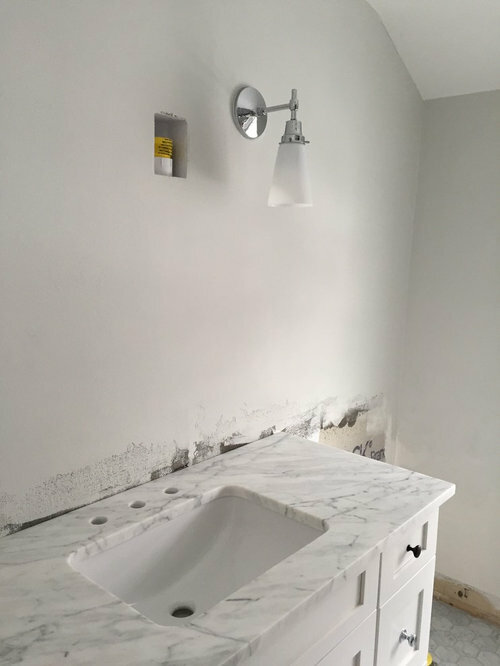 With the exception of the shower walls we just have soft white painted walls in our bathroom with our marble floor and countertops. I think anything else would just look too busy for me at least. you don't have to do beadboard. you could do a simple wainscot or board and batten. wm simons I need something there because the walls aren't finished at the bottom. 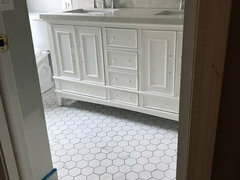 This is a new bathroom so when we were putting up the walls I thought I would do tile on the bottom but now I'm rethinking that but still need something. Easier to get the carpenter than the plasterer. Everyone in town is so busy. Beth H. I thought about larger subways but I just don't love them somehow. I do like the 2 x 10 and I thought maybe that would ease the scale problem with the 4 x 4 hex on the floor but it's still kinda busy. I am still planning to put the subways in the bathtub surround. Thank you for the photos. There are a lot of options on the wainscotting. I'm going to spend some time looking at a bunch of pictures. Thank you!! Don’t continue until you make some decisions on the counter and floor. 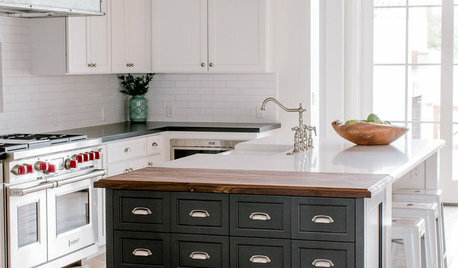 White subway tiles will make the mismatch even worse....horrible, in fact, because they will not match any part of the counter. The backsplash can be made of the same material as the counter for a better look, but it must be the same material in the same color. The floor and counter don’t look terrible, and you may get used to it in time. Floor partially installed but mixed feelings about layout -rip it out? 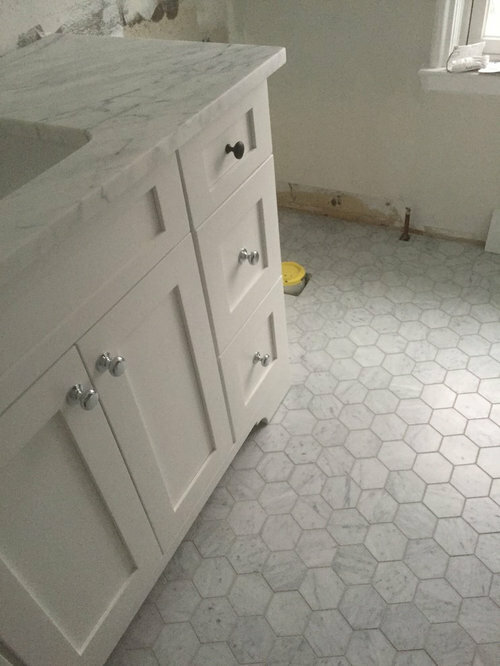 Is marble subway tile more difficult to tile than other tile? Should i rip out my marble?